Stargazing has always been a favorite activity for campers. The tiny pinpricks of light overhead have dazzled humans for millenia, and even though we have so much left to learn about them, we have better understanding than ever before. Set your calendar to go camping during upcoming night sky events, and tap into online resources to get the most out of your stargazing experience. If you live in North or Central America, there are several tour lunar eclipses to see this year — four to be exact. They are all within six month intervals of each other, making for a "lunar eclipse tetrad." Total eclipses appear to turn the Moon red as it passes through the shadow of the Earth. Best of all, they are completely safe for viewing. The first is on April 15th, and the next is October 8. Following this are April 4 and September 28 in 2015. Of these, only April 4th, 2105 is on a weekend, and weather that time of year should make it a perfect candidate for a camping trip. Book it early! For more information about the lunar eclipse tetrad, read NASA's post here. Meteors, commonly called shooting stars, are asteroids that enter Earth's atmosphere, lighting up for a brilliant show. Meteor showers are created by the debris from a passing comet, and there are several to enjoy this year. The Lyrids, maxing at about 20 meteors per hour, will occur the night of April 21st. Eta Aquarids, which can produce as many as 60 per hour, will follow just a few weeks later on May 5th. On July 28th, Delta Aquarids will give a smaller display. The best meteor shower of the summer camping season may be the Perseids, produced by comet Swift-Tuttle. Even though the moon may block some of the shower, the meteors will be bright and plentiful enough that they'll still prove beautiful. Check it out the evening of Tuesday, August 12. If you're up for some winter camping, set your calendar for Saturday, December 13 to watch the Geminids shower. At its peak, it produces more than 120 meteors of a variety of colors per hour. Of course, not everything visible in the night sky is natural. More than 2,000 man-made satellites orbit the planet. The largest artificial object in orbit is the International Space Station, and it's visible from Earth, given the proper weather and light conditions. Before you go camping, use NASA's Sighting Location Lookup web application to discover when the ISS and man-made satellites will be visible overhead. Set a digital watch or your phone to beep and remind you to look up while you're sitting around the campfire. 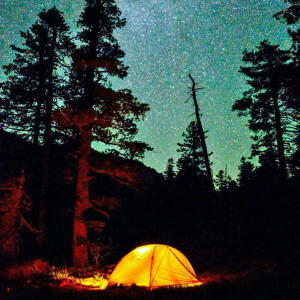 Is stargazing a favorite camping activity for you and your family? What tips do you have for making the most of your stargazing experiences?